The products were produced, packed and distributed without undergoing federal inspection. 24-oz (1.5-lbs.) jarred pasta sauce containing Stino Da Napoli Gourmet Meat Sauce Bolognese with lot code 181284000013. 24-oz. (1.5 lbs.) jarred pasta sauce containing Stino Da Napoli Gourmet Pasta Sauce with Bacon Fumo Del Vesuvio with lot code 181284000303. 1.3-lb. 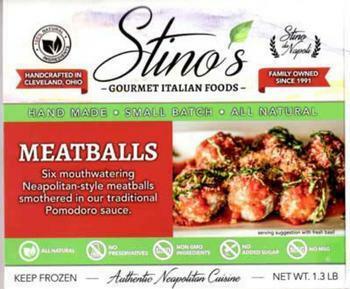 packages containing Stinos GOURMET ITALIAN FOODS MEATBALLS with lot code 181284000167. 1.2-lb. packages containing Stinos GOURMET ITALIAN FOODS MEAT LASAGNA with lot code 181284000150. The recalled sauce products, bearing establishment number EST. 45779 inside the USDA mark of inspection, and meatball and lasagna products, without the USDA mark of inspection, were shipped to retail stores in Ohio. Customers who purchased the recalled products should not consume, but discard them or return them to the place of purchase. Consumers with questions about the recall may contact Christian Iacullo at (216) 536-6107.